As reported by the female reporter in Chopper 4, they were around 5 miles north of the towers when the orb was captured coming from over west. Shot from the Empire State Building, like NY1 above, but from a different camera. It could be guessed that WB11 (now "WPIX Home of the CW") cropped the NY1 wide shot to create a zoomed view with better aesthetic balance... but no. Recently (July 2009) YougeneDebs used trig to discover the WB11 view "seems to be on the western half of the ESB at about the 88th storey. Notice the Staten Island shore line and structures there behind One Liberty Plaza, the old U.S. Steel building, the black building just to the left of center-frame for an estimate of the height of the perspective." The NY1 camera location is described above. 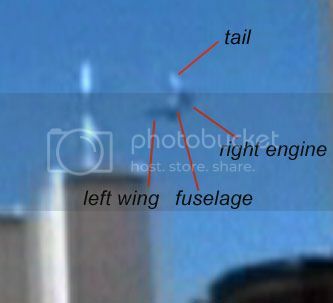 This is the 3rd angle WCBS used on 9/11 to show the plane... all in 3 minutes. Here the plane passes the distance between the Empire State Building and the WTC in two successive playbacks (9:04 and 9:05). The full approach of "Flight 175" is shown from this angle later at 9:17 (and 9:22, abbreviated). That is, the tape starts from pause— with the plane in a circle. Every distance would have produced a ledgible image of a 767 for either tower but no image has ever surfaced. The north tower blob compared to a decent fake of UA 175 compared to a real boeing 767. Flight 11 and 175 were both supposed to be 767's. Last edited by frisco kid; 09-17-2016 at 03:35 PM.